Saturday- Happy Birthday Bob! We went grocery shopping to pick up items to make crock pot meals for traveling. This works really well for us. One day we cook the next day we eat leftovers. We went to Smiling Moose for a last sandwich, then returned home to sit and watch someone with a 5th wheel trying very hard to back into the site next to us. I think his problem was that he had three people trying to tell him what to do. When Bob and I do the backing it works well with just the two of us. If anyone else gets involved it does not go well. When the show was over we took a nice nap. I had been up since four am with my head congestion so I really needed to lay down. Bob walked the dogs and then we settled in to putting together about 8 crock pot meals. Since it was Bob’s birthday, we went out to go to dinner at Golden Europe, his choice. Unfortunately, we arrived a little late, about 6:20 and could not get in the door. So we punted. His second choice was to try an Italian restaurant on Federal at 72nd, called Bovine. The restaurant was busy, but we were able to get a table. The service was slow and we did not like their tomato sauce. Oh well, and we had high hopes when we got there! We returned home and watched some shows on the DVD. At least Karlie ate this evening! Sunday- We did our usual budgeting and watched the Redskin game. After the game, we went to Total Beverage. We bought some beer to take to a friends house in AZ when we get there. Bob bought Colorado beer for them to try. We returned to the MH and cooked dinner. Monday- We dropped the dogs off at Two Ponds Spa for their grooming. We only had Karlie groomed and Roxie received a bath. I dropped Bob off at the Laundromat. We are doing all the bedding, so this is going to take a long time. I had my last PT this morning. Since I have the cold, I did the best I could,but it was a struggle. I said farewell and thank you to Sara. I was able to do 21 on the Felxinator and did well on the leg press. I returned and picked up Bob. We were still early to pick up the dogs, so we stopped at Burger King for lunch. Then went to King Soopers to pick up some Boars Head sandwich meat. Only one of the King Soopers has the Boars Head. Then we ran over to Two Ponds. The groomed had called and said that Karlie’s ears were so matted she had to shave them close. That was because she had left them too long last grooming. Anyway, she wanted permission to shave them really close. We agreed, but Karlie looks funny with the shaved ears. They were reluctant to give her the grooming and bath due to the stitches, but I had checked with the Vet and she had said it was okay. We picked them up and took them home. Bob immediately had to run to his diabetic ophthalmologist appointment. I had to wait at home for Dan the RV tech to arrive. Dan was late, arriving at 1:50, instead of 1 PM. That was okay, he found the problem, and it was a cheap repair. Bob ran to the Super Walmart, on his way home, to pick up his prescription then to the Walmart Neighborhood Market to pick our Dermatology medication. It had not arrived, so we will have to pick it up tomorrow. He returned in time for Dan to show him what the issue was with the steps. He walked the dogs and we continued doing laundry. At 4, we went to social hour, since it was nice out. We said farewell to everyone who is still here. I gave them ‘virtual’ hugs, since I have the cold. We returned to the MH about 5 and did some work. Bob put away the chairs, as it is going to rain tomorrow. We took the dog fencing out of the MH and put it in the car. MaryAnne had called me to let me know that Paradise is no longer allowing the fencing. What a pain that is going to be, but we figured we will just do without. This freed up some space, which we of course, immediately filled in. We ate leftover casserole for dinner, watched TV and went to bed. Just before bed, Bob discovered that his emergency bracelet had fallen off. He looked around the MH for it, but we don’t think it is inside. Tuesday- We both woke up early as Karlie has figured out she came make noise with the cone on. She shook her head to wake us up so that we could let her under the covers. So we got up early. I needed to clear out my head and lungs. We left a little after 8 AM and went to the storage unit. We traded in the dog fencing and rebar that we used to keep the fence up. We picked up pictures to scan, holiday items, and scrapbooking paper. We also picked up the folding trash bin for us to use in Quartzsite in January. We ran to Safeway to pick up a few items, then Walmart Neighborhood Market pharmacy to pick up the Dermatology medications. We stopped by the Library to return the three books I have just finished. We returned to the MH, put things away, and Bob found his emergency bracelet in the driveway, next to the car, in front of the MH. Bob took off for his 11 AM Neurologist appt. He has been doing very well with the Vitamin B12 shots monthly , so the Neurologist discharged him. He returned home,we ate lunch, and I left to go to a hair appointment. Bob made our reservations for the next six days. He walked down to the Lodge to make sure that we did not have any mail. On the way back he saw the propane company taking away our propane tank. When we arrived Bob had ordered a 38 gallon tank for the summer. He had called and asked them to pick it up tomorrow, as we are going to use the propane tonight. We are out of propane in our MH tank. Hopefully it will not be too cold tonight. It was raining, so traffic was awful. I arrived home at about 5 PM. Bob and I left to go to Golden Europe, since we were not able to go on Bob’s birthday. We had a great dinner and brought home leftovers to take with us traveling. Wednesday- It did not get too cold last night! Finally, we are leaving! But first, I had my mammogram this morning. All went well. The sky was clear and the mountains visible from my drive. There is snow on the high peaks! I returned and we finished preparing the MH for travel. Bob drove the MH out of our spot and down to the parking lot, with me following in the Edge. We had to set up the braking system, which is different from with the CRV. It takes a little longer. Here is a picture of us set up and ready to leave. We drove out of the Lodge parking lot at 10:45. Late for us, but we are only driving to Cheyenne. It is about 1 1/2 hours away, so we are taking our time. 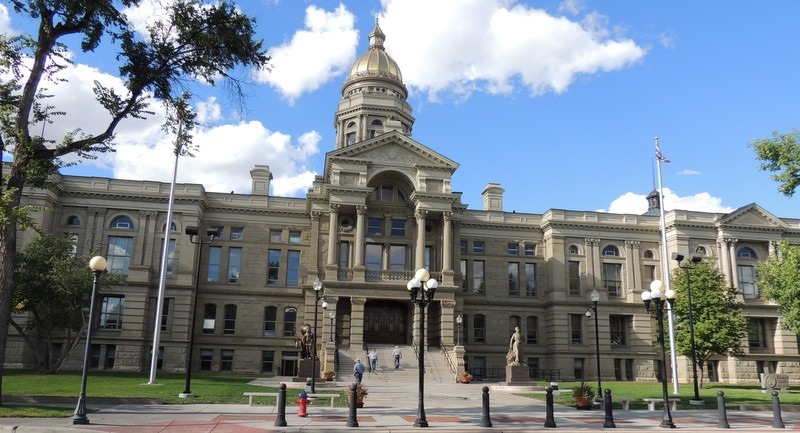 We would travel farther, but there are no inexpensive RV parks in the area north of Cheyenne. We drove out Hwy 36 to I-25 north. We were very glad that we were not driving south, as the southbound lanes were backed up for miles! We continued north to just south of Cheyenne. We pulled into a new rest area, which is one of the nicest areas we have ever visited. Bob walked the dogs ( there was also a dog park there) and I went in to find information on Cheyenne. I picked up brochures and told the gal behind the counter I would be back with my husband. We both returned to the MH and ate lunch. Then Bob and I went back to the Visitor Center. 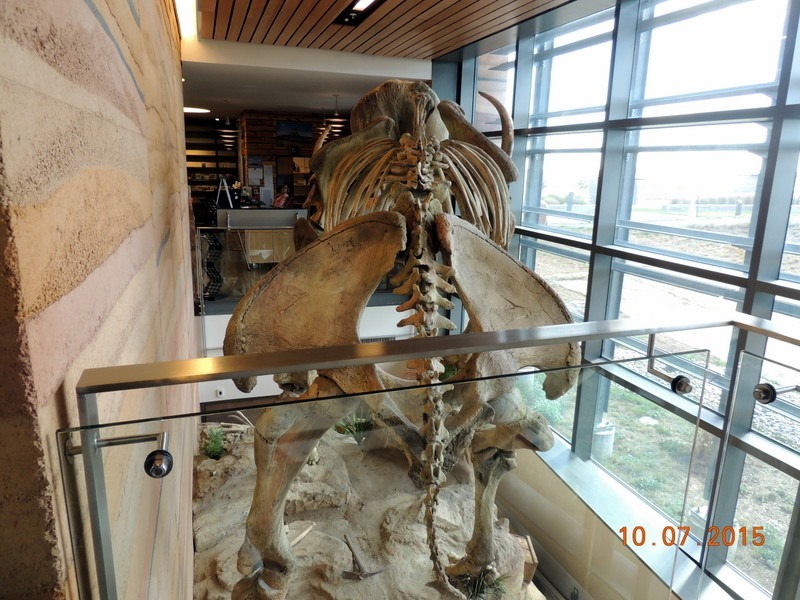 There was small museum with a Columbian Mammoth cast named Dee which is in the center. The dinosaur is 11,600 years old and was discovered in 2006 by a man named Dee Zimmerschied, a bulldozer operator. 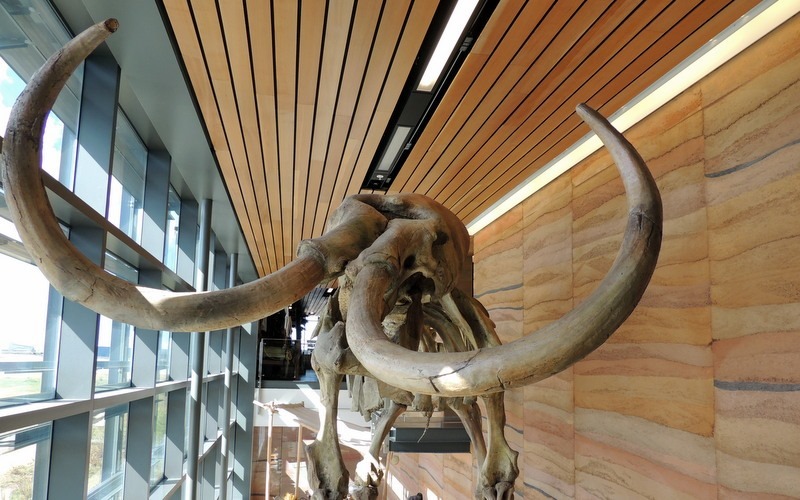 The Mammoth was a male, 65-70 years old. He was 13’8” at the shoulder and weighed 700 lbs. 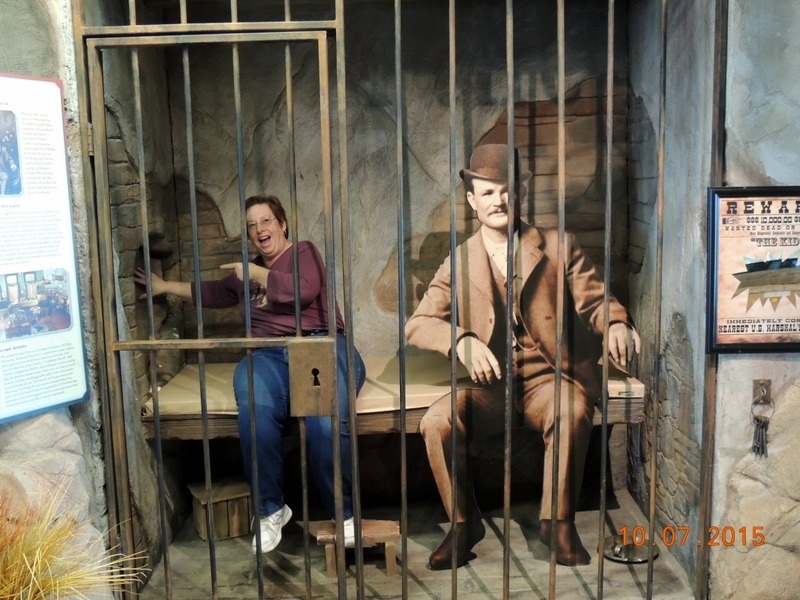 We both visited Butch Cassidy in jail and saw how he escaped. from the Wyoming jail. I am pointing to how they escaped, out a tunnel. There is a kids slide on the other side for the kids to “escape”. We left and drove farther north to the Flying J. We topped off the diesel tank and purchased propane. Then we had to drive back south, about 2 miles, to the campground. We are staying at Terry Bison Ranch Resort, a Passport America park. This is quite a resort and here are the bison. 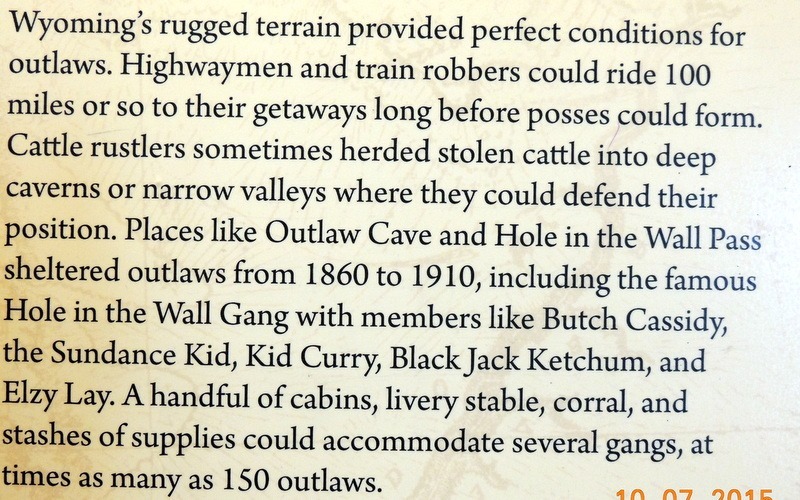 The resort was originally a ranch where Teddy Roosevelt used to spend time. There are a lot of amenities during the summer. They do not let you arrive before 2, or you pay for an extra day, and we managed to arrive at 2:06. We settled into our site and set up the MH. We left a little before 3 to go to Cheyenne, about 9 miles north. 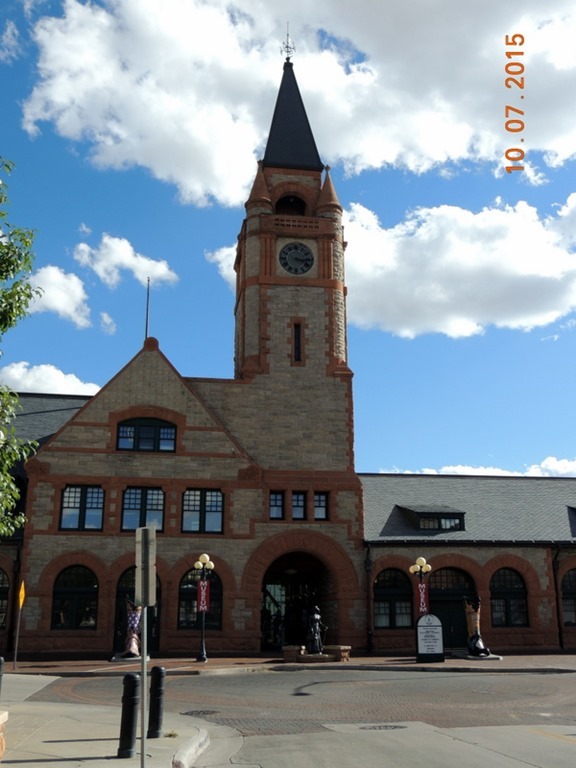 Our first stop was at the Cheyenne Train Depot plaza/museum and visitor center. We stopped in to obtain the map of the ‘Talking Boots’. There were four, right at the Visitor center. 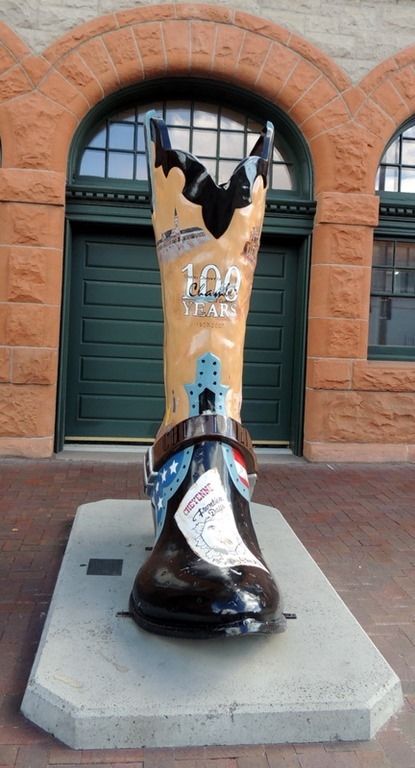 “These Boots are made for Talking” was a joint project of the Cheyenne Depot Museum foundation and the Downtown Development Authority. 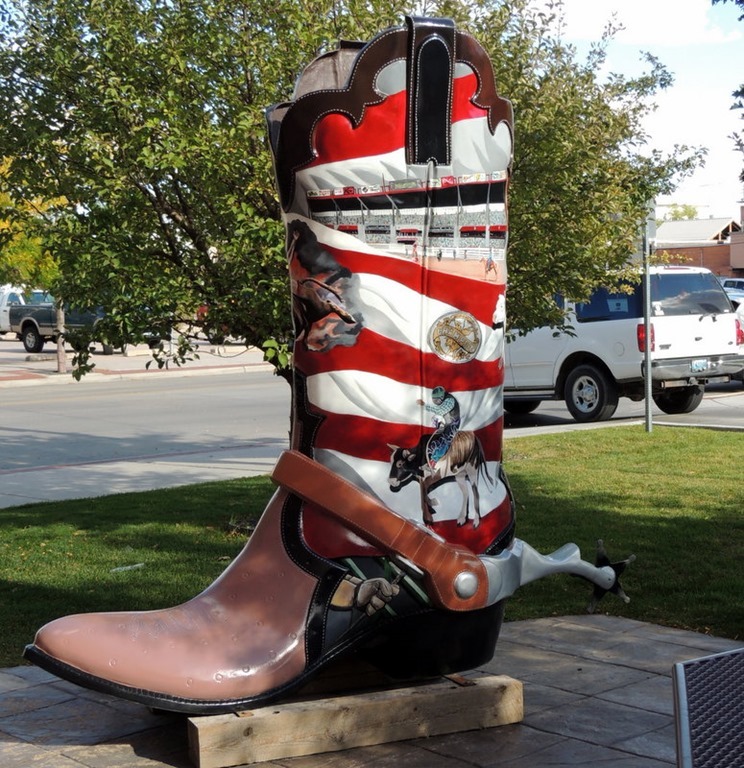 The boots were sponsored by local businesses and auctioned as a fundraiser. 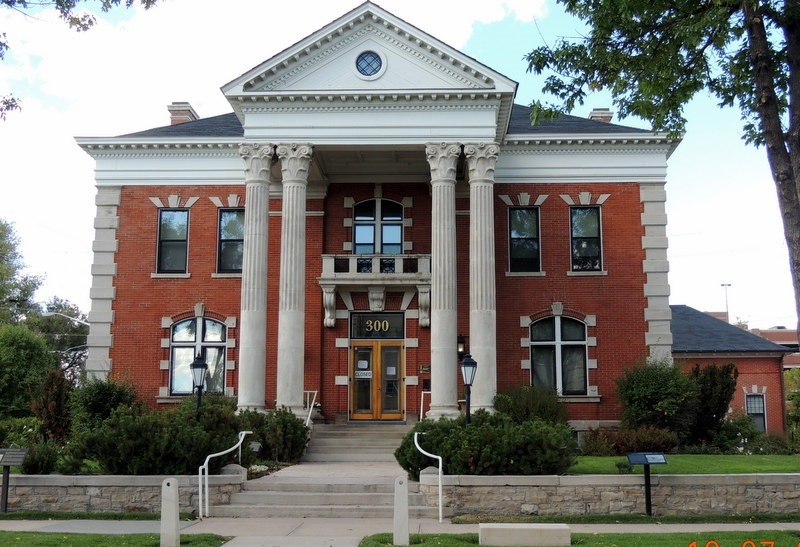 Nearly $100,000 went into the Depot Museum Endowment fund. 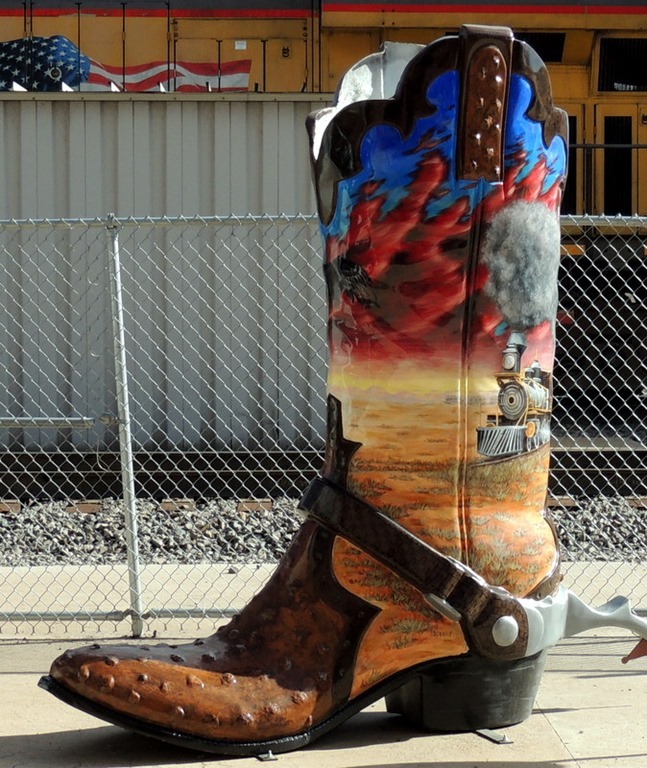 The boots were painted by one or more of the local artists. 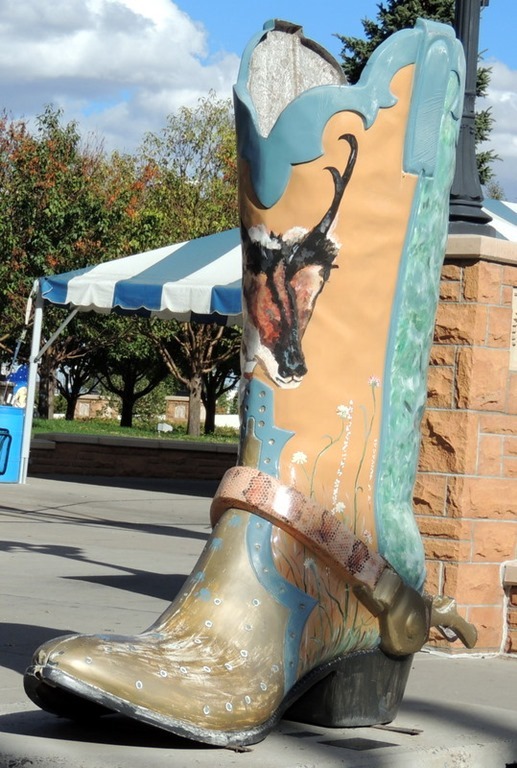 The theme was if the boot could talk, what would it say. 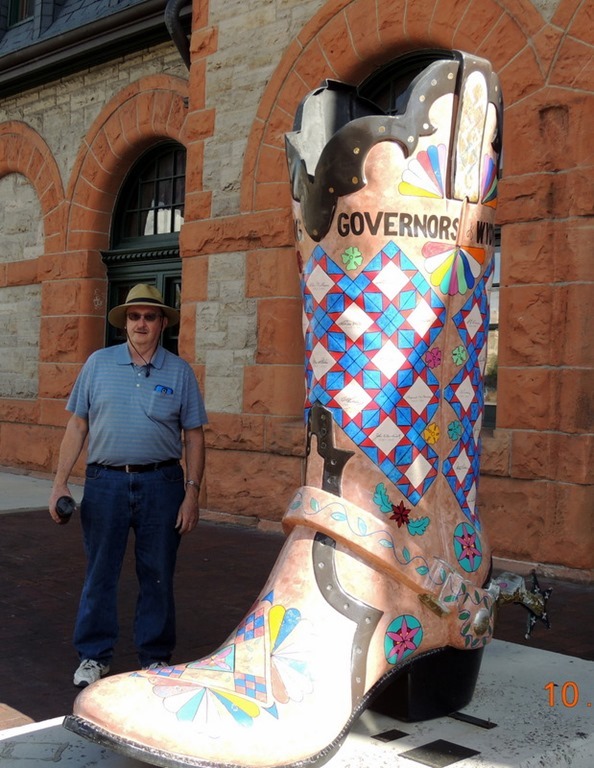 The boot above with Bob in the picture is to show how large these are; it represented the governors of Wyoming. The second boot I could not find on the brochure, the third celebrated the Chamber of Commerce 100th anniversary, and the fourth was “Don’t feed the Animals”. We left there and went to the Governor’s House. We thought we were lucky, as it is past the season and the building is only open for tours from 9-5 on Wed- Sat. We arrived to find a big closed sign on the door. Guess we will have to do that another time. It is a self guided tour and free. Next we went to the Capital building. The corner stone of the building was laid on May 18, 1887. It is a very nice old building with many sculptures around the building. Unfortunately, it is being closed for renovations any day. They seemed to have cleared out most of the building. The last renovations were in 1982. We stopped at the information booth. We walked right in, no passing through security or anything. The Governors office is right inside the door and the Secretary of State was right down the corridor. Guess that is why they are doing renovations, to make the building more secure. 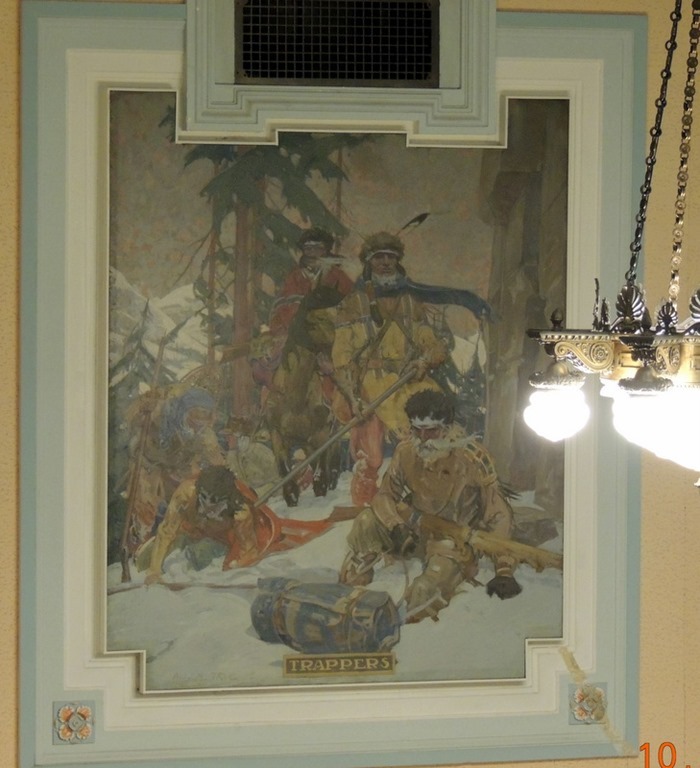 We took an old elevator up to the third floor to look at the murals. These are in the House side. 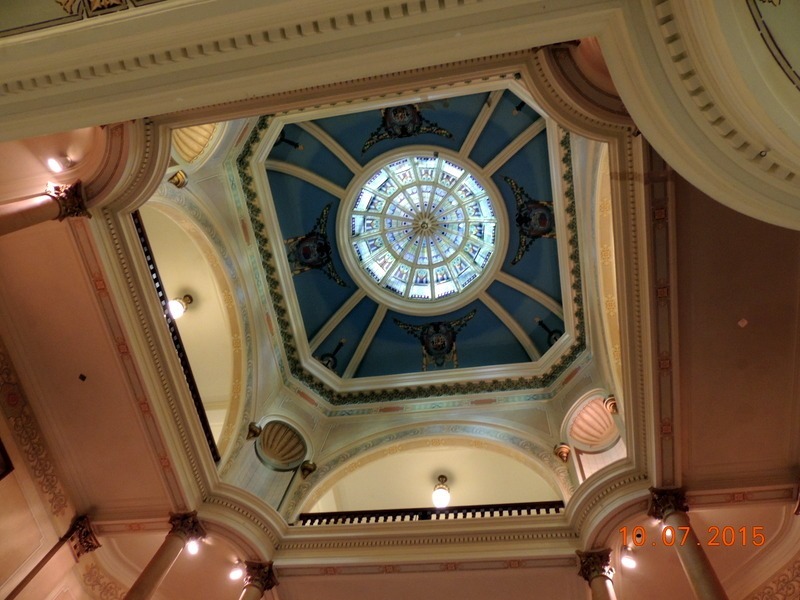 They were not much and the ones in the Senate side were even less, but the ceiling in the rotunda was pretty. 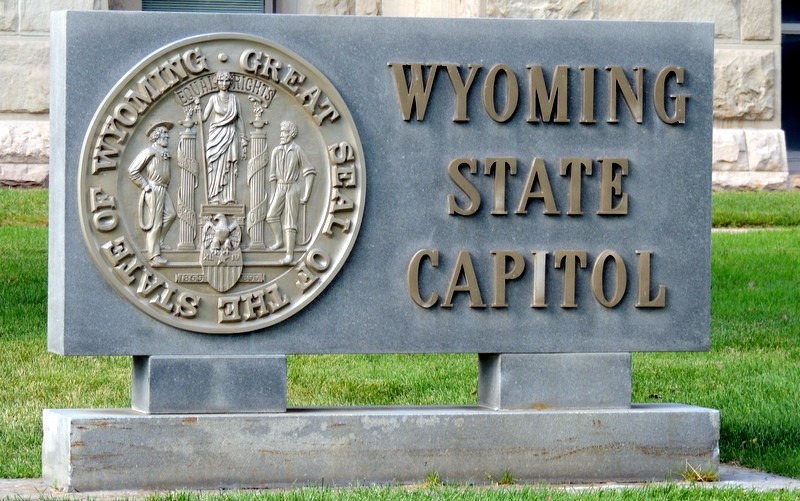 The building was designed by the same company as the Capital in Washington DC. We left there and went to look for more of the ‘’boots”. The one below is “8 steps to the Big Time” I guess for rodeo. It was in front of a bank. The next boot was not on the brochure. It was located in front of the local Catholic Church. That is out car in the background. 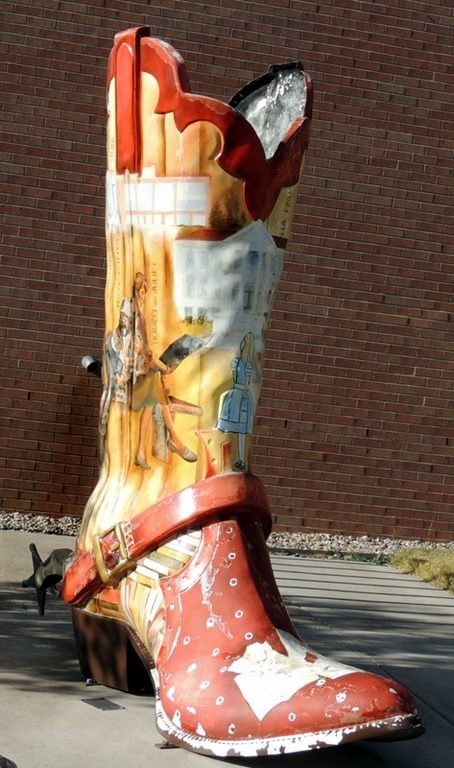 The next was the Book Boot, located in front of the library. In all there were 20 boots. We did not go looking for all of them. 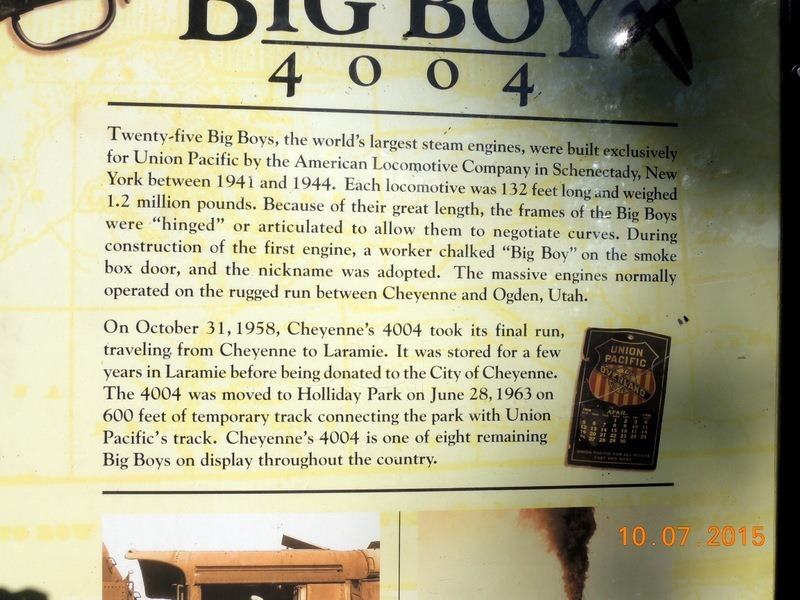 After taking pictures of the boots, we went to Holiday Park to look at the 404 Steam Engine. The 404 is one of 20 of these engines. 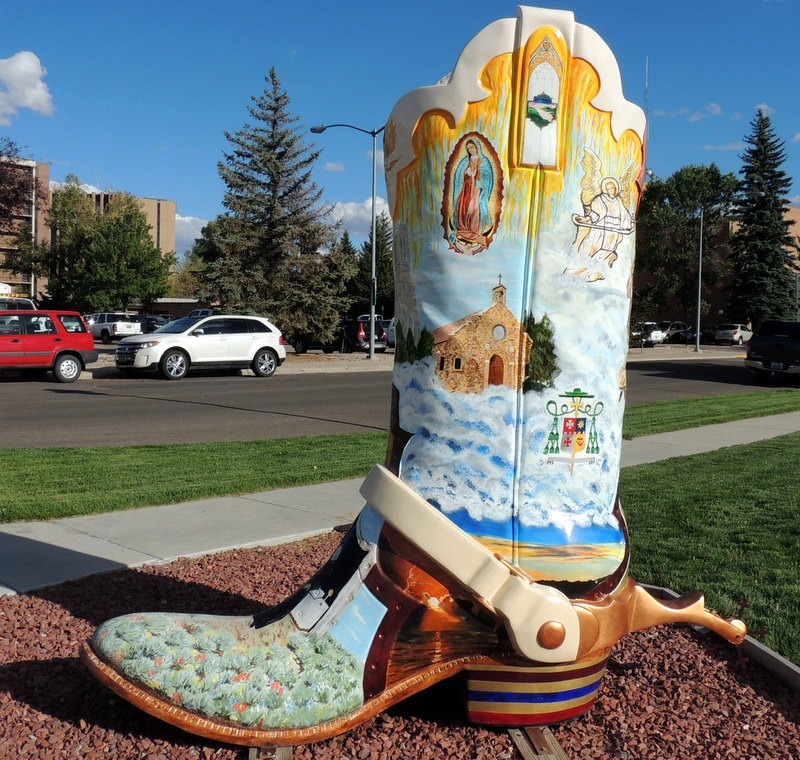 This is one of 8 located around the country. This engine is huge! The park was very pretty and in use while we were there. 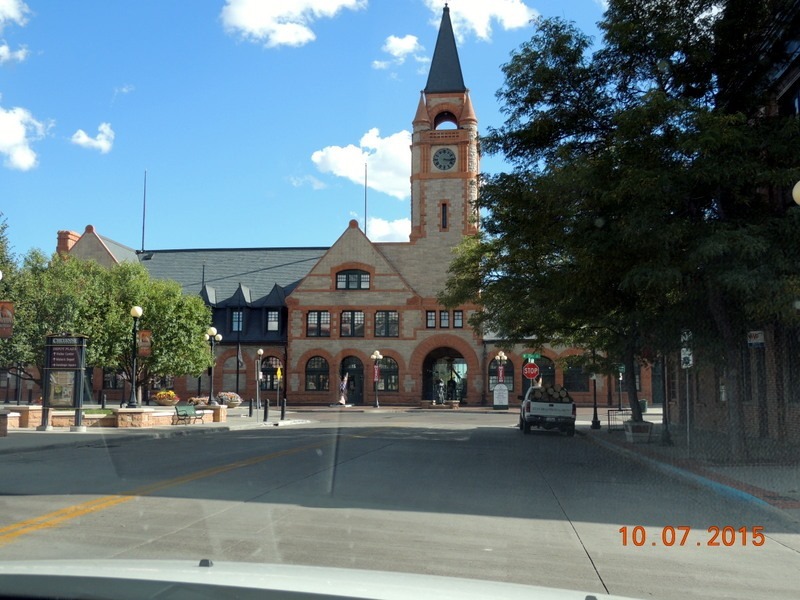 Cheyenne is a very nice little city, with a lot of construction and one way streets, but not a lot of traffic. We returned to the MH, walked the dogs, ate dinner of left over Italian from last Saturday night, watched TV and collapsed into bed. Thursday- We left at about 9:15 driving north on I-25 through Wyoming. We started at exit 4, and left I-25 at exit 92, turning onto US 26 east. Below is a scene from I-25. The two above were taken from US-18. We stopped for lunch at a rest area. 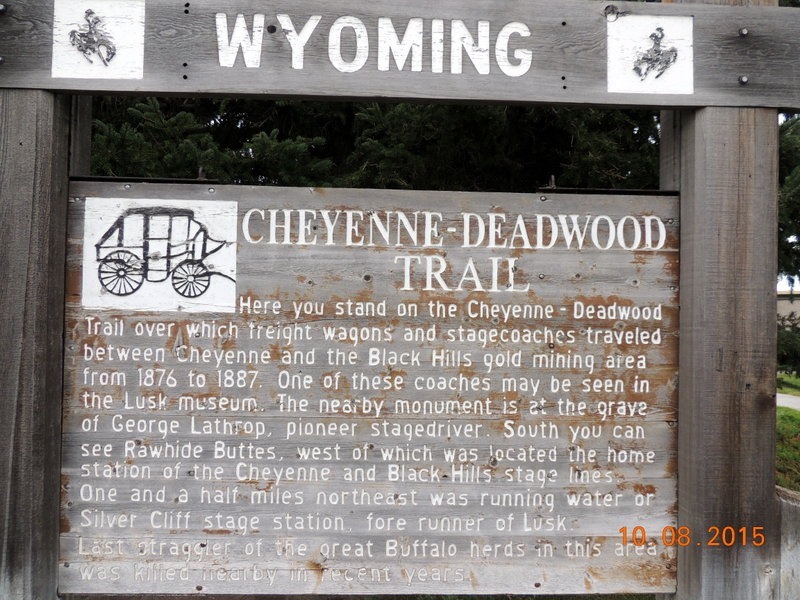 The entire day we were basically traveling on the Cheyenne to Deadwood stage coach route. We went about 16 miles turning north onto WY-270. This is when we started to rock and roll. 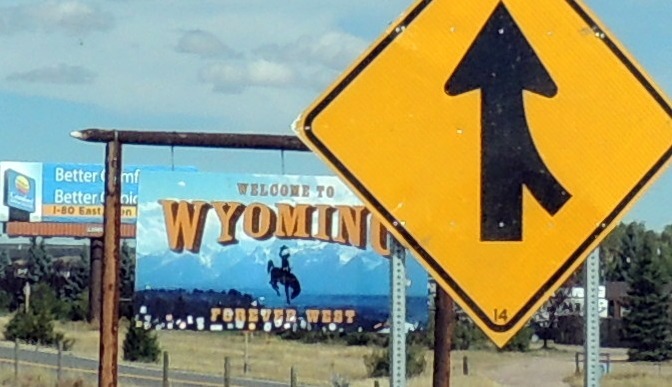 WY 270 was two lanes with no shoulder. It was very bumpy and had lots of curves. We were really glad to turn onto US-18E /US 20 E.. We stayed on US 18 E all the way into South Dakota. We followed US-18 E to SD-79 north taking us to Rapid City. We picked up I-90 and drove north to Black Hawk. We are staying for 5 nights at Three Flags RV Park, another Passport America park. We have for $23.75, FHU with cable TV. We ate leftovers for dinner, watched TV and went to bed. 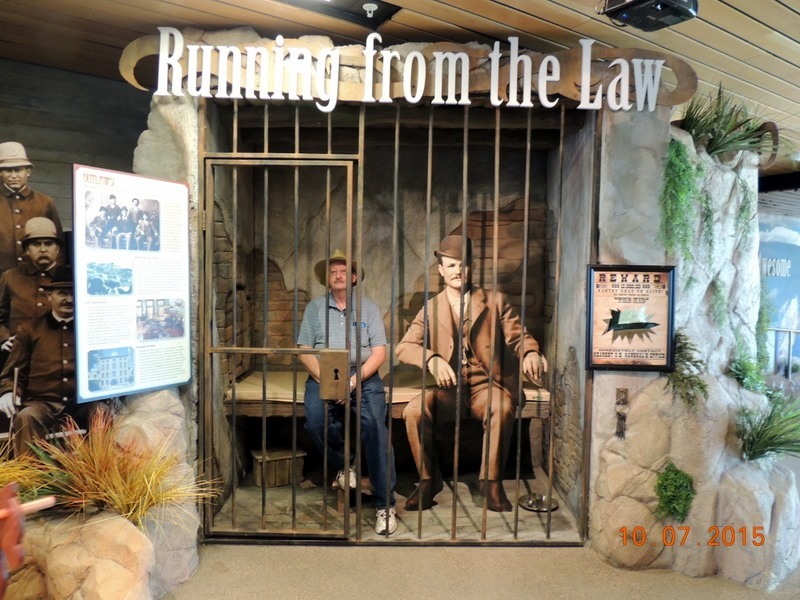 Friday- We left at 8:15 to go to the South Dakota MVA to renew our drivers licenses. We both had appointments scheduled at 9:00 and had both received numerous messages about the appointments. We arrived at 8:45 and were done by 8:54. That sure does not happen on the east coast! We left and went in search of a car wash. The car was covered with dirt from following the MH yesterday through a rain storm. The first place we went was a self serve. The second had an automatic bay, but there were about 15 vehicles ahead of us. We got in line and waited about 15 minutes. Then the machinery broke, so we left. We went to the Visitor Center for information and also asked where there was another car wash. The nice lady sent us down to the road to one. Once we finished, we went downtown, stopping at Jerry’s Cakes and Doughnuts for a very nice fresh doughnut. 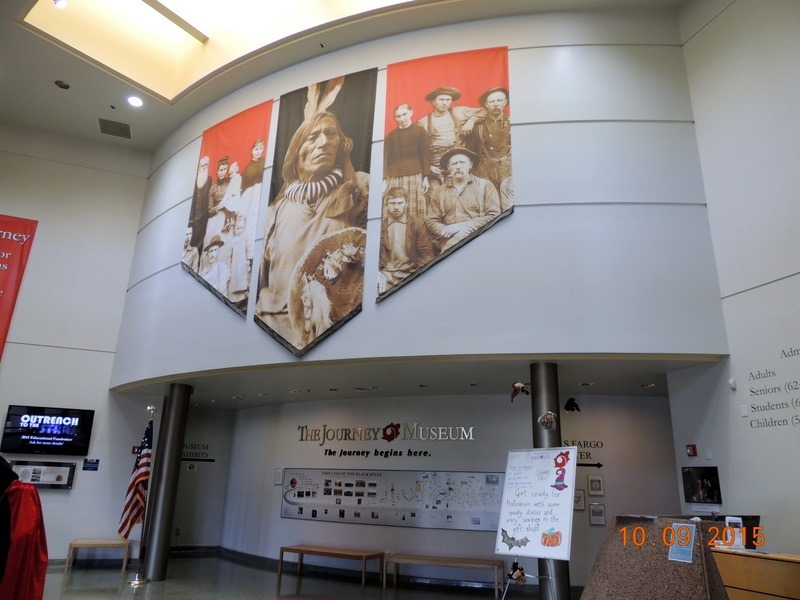 We left and went to The Journey Museum, $8 each, senior rate. 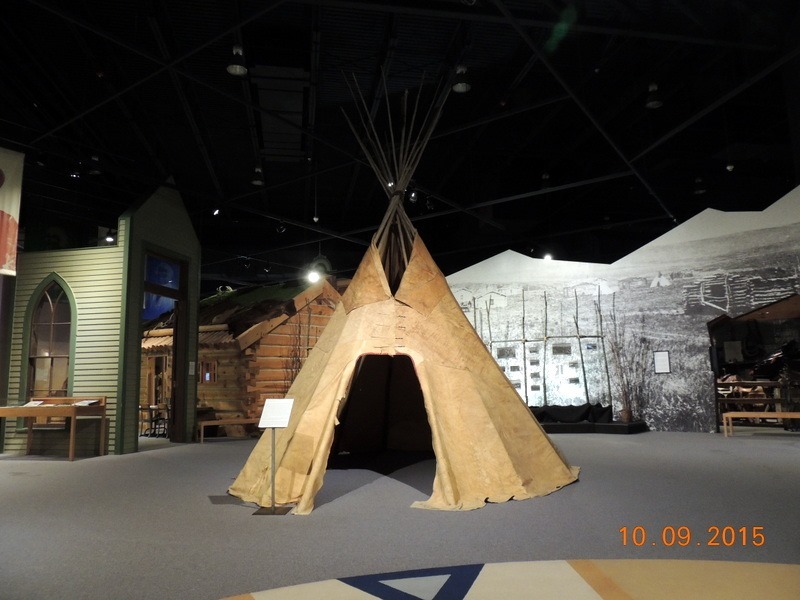 The museum brings together four major prehistoric and historic collections to tell the complete story of the Western Great Plains. The journey begins in the Star Room, which was twinkling lights meant to show the birth of the elements that make up the universe. 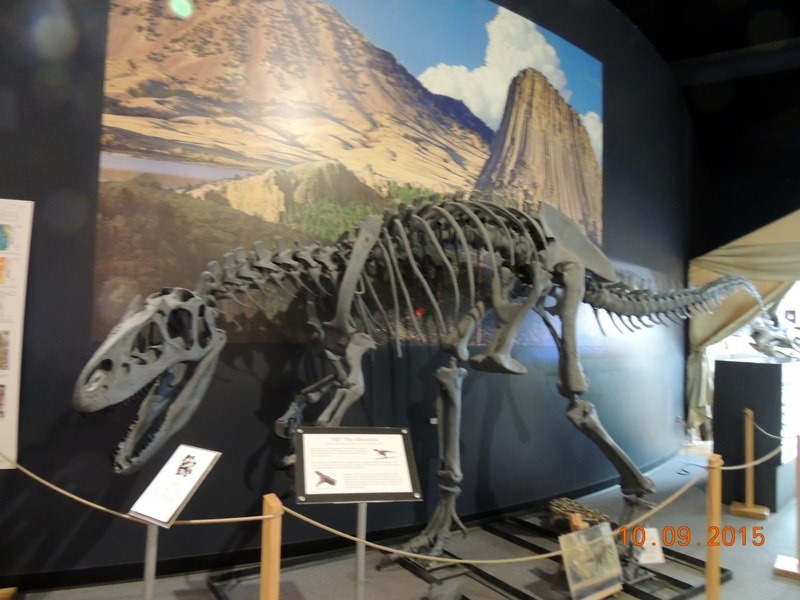 The next area was the Museum of Geology. 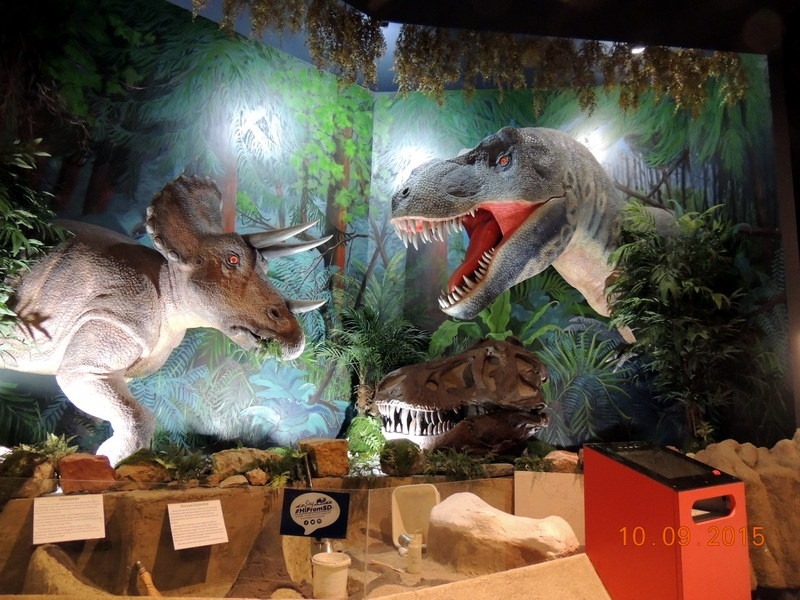 There was interactive exhibits of rocks and a dramatic rock wall which showed the rock formations in the state. 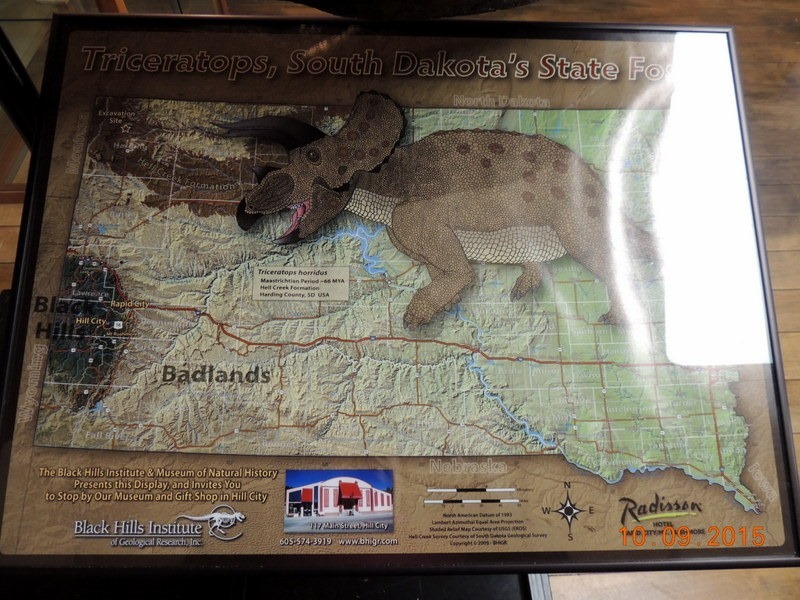 The Badlands were formed when the crust of the earth erupted, raising the rocks of the badlands. This occurred over 60 million years ago and occurred over 30 million years. 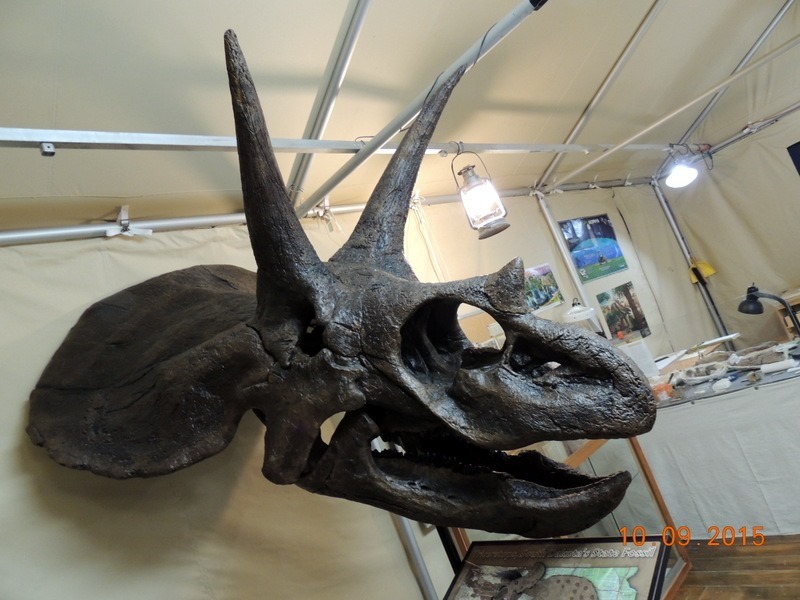 So was this one’s head… This is the state Dinosaur. I thought that this poster was interesting. 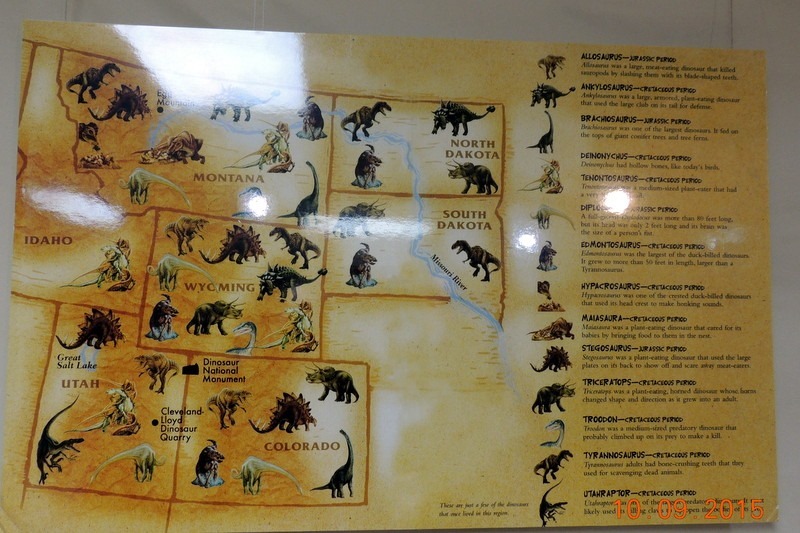 It shows the various dinosaurs in the Western States. We moved on to being able to touch some dinosaurs teeth. BIG TEETH! 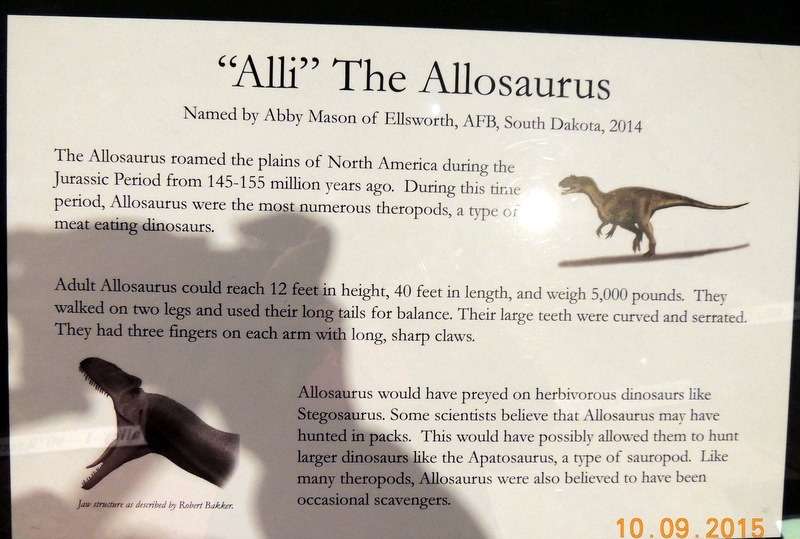 This exhibit shows the two dinosaurs, and below the big one is the real head, with very large teeth. The next exhibit area focused on Archaeological Research with them showing a dig. They also had exhibits discussing petroglyphs. 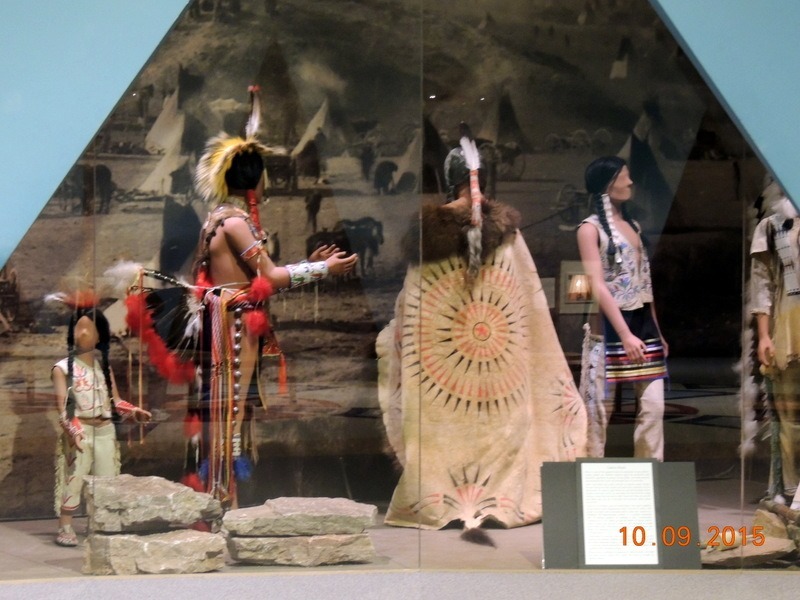 The next area follows the path of the Lakota in the Sioux Indian Museum. Horses had become extinct in North America. Europeans brought them over and the Indians had procured some of them. 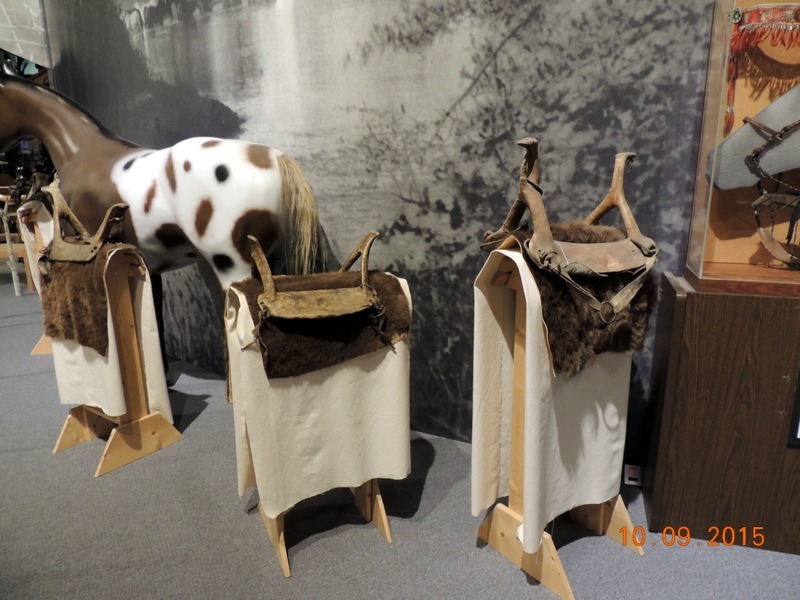 These are the Indians saddles. 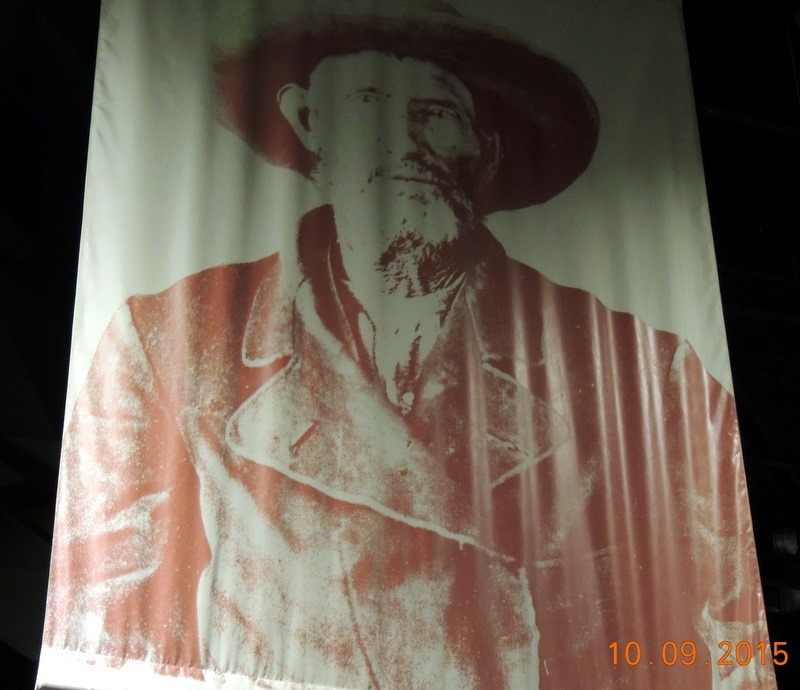 A story I found interesting was of Dewey Beard, a survivor of Little Big Horn and Wounded Knee. He was a Lakota, born in 1862. He grew up on the prairie, as a hunter and warrior. 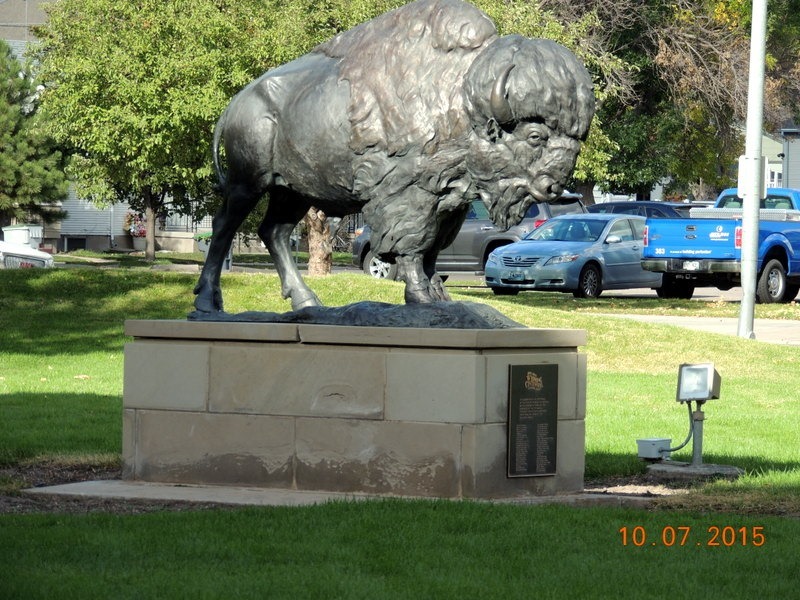 He killed one of Custer’s Soldiers during Little Big Horn. After Crazy Horse was murdered, he went with his family to Canada. They were starving there, so they returned. 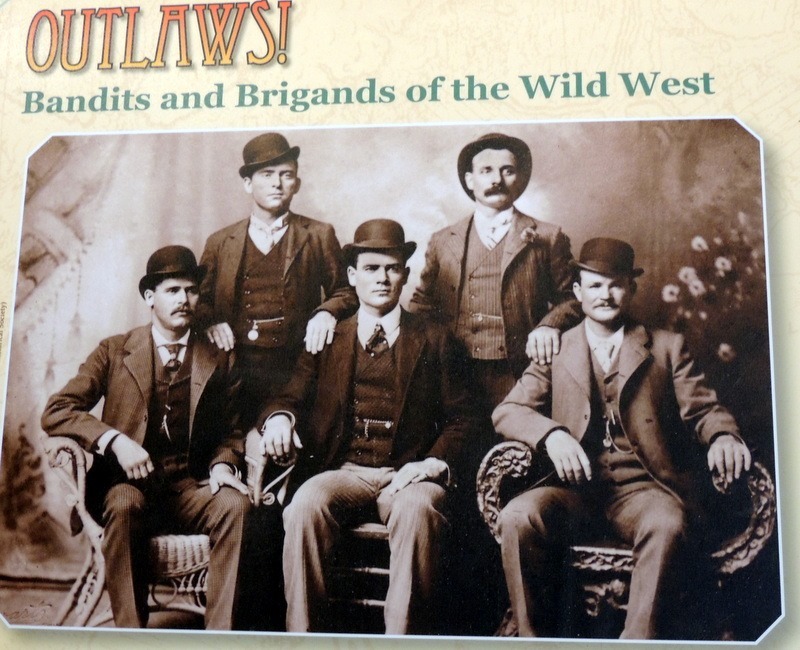 He ended up joining Buffalo Bill’s Wild West Show. He died in 1955. Below is his picture. 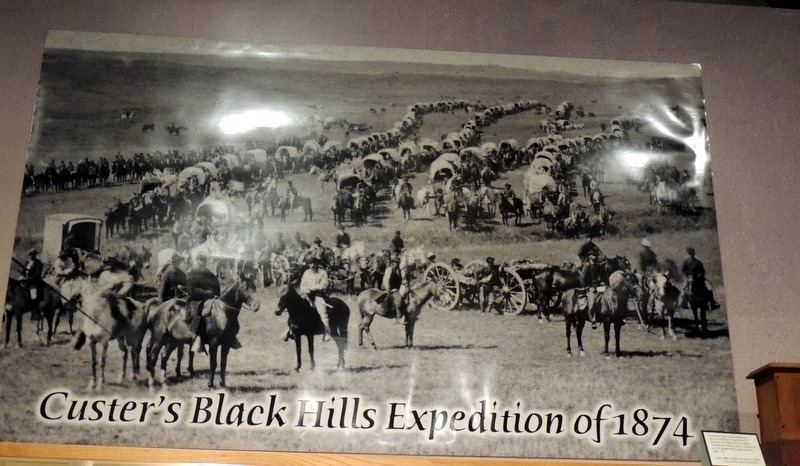 Here is a picture of Custer’s Calvary. 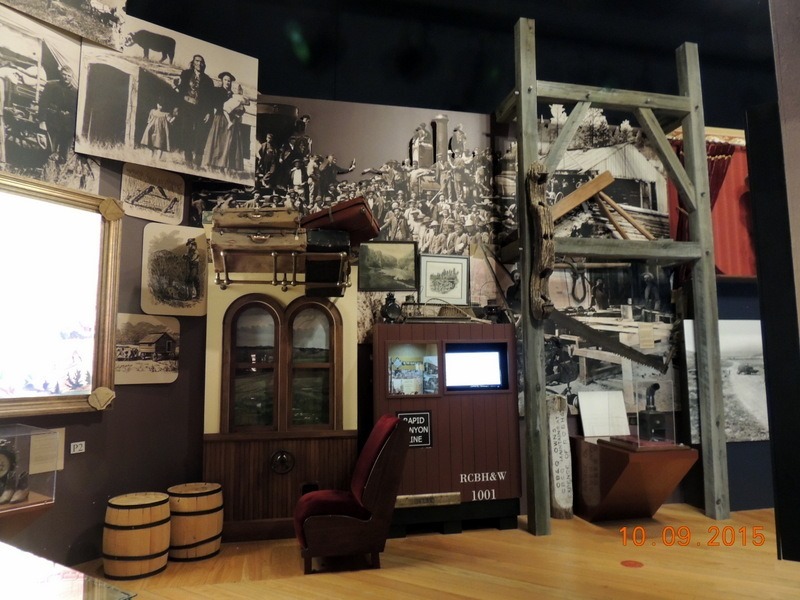 The next area was the Frontier experience as part of the Minnilusa Pioneer Museum. 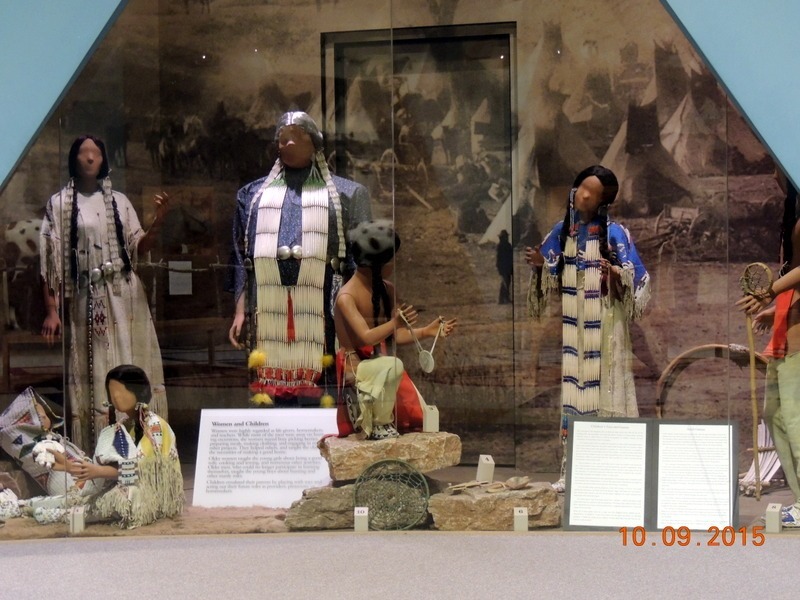 There were a number of displays, similar to what we have seen before in other museums. Right on time, as we were completing our tour, they announced that they were showing two movies. 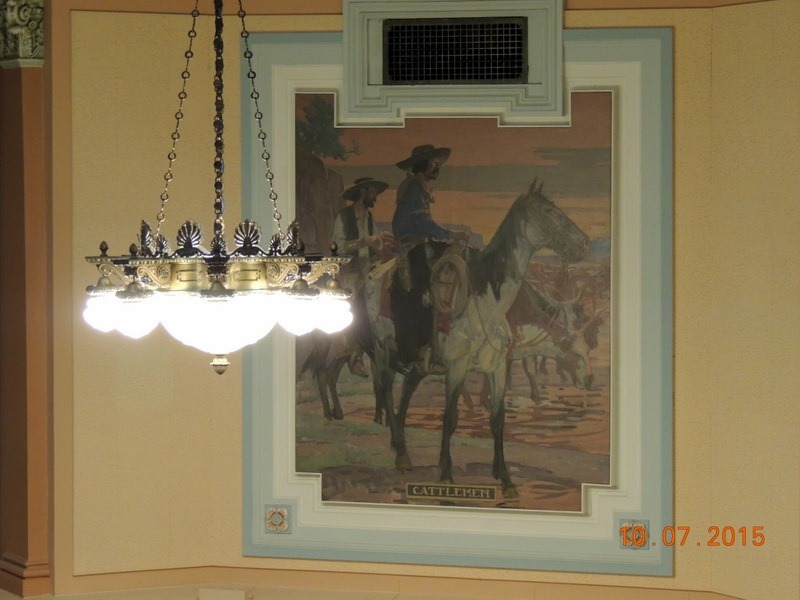 We went into the Wells Fargo theater and watched a South Dakota Public Broadcasting movie. It was an aerial documentary of western South Dakota. It was awesome to watch from the sky, the areas we will be traveling over the next few days. This was a view that we will not be able to see. (40 minutes). We also watched a movie about the Journey (14 minutes). 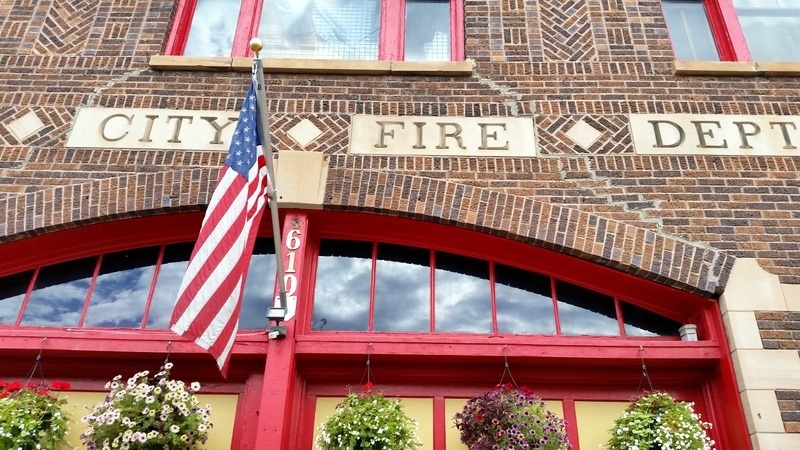 We left and went to lunch at the Firehouse Brewery. Bob had soup and sandwich and I had white chili. Bob also had the a pint of the Pale Riders 20 Year Stout, which he proclaimed to just be okay. 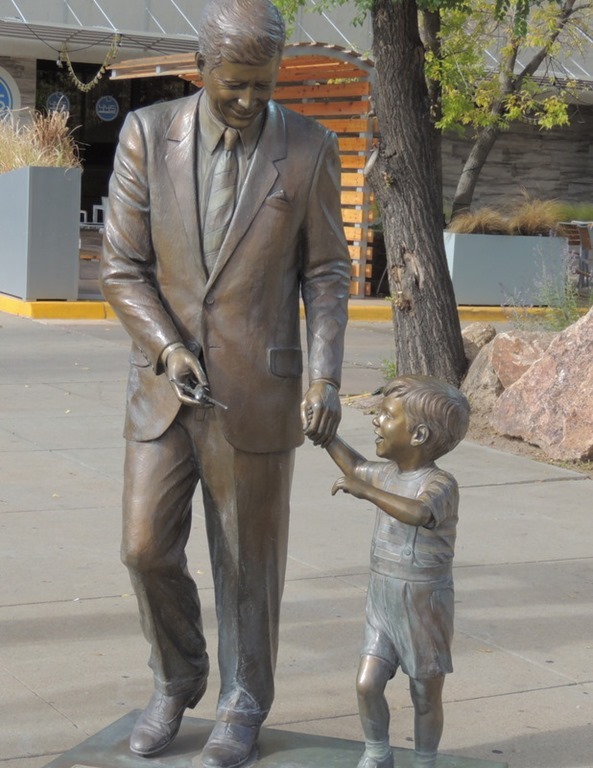 We walked a bit looking at some of the statues of Presidents. They have every President through George W. on two streets. Here are some…. They are supposed to be life size. 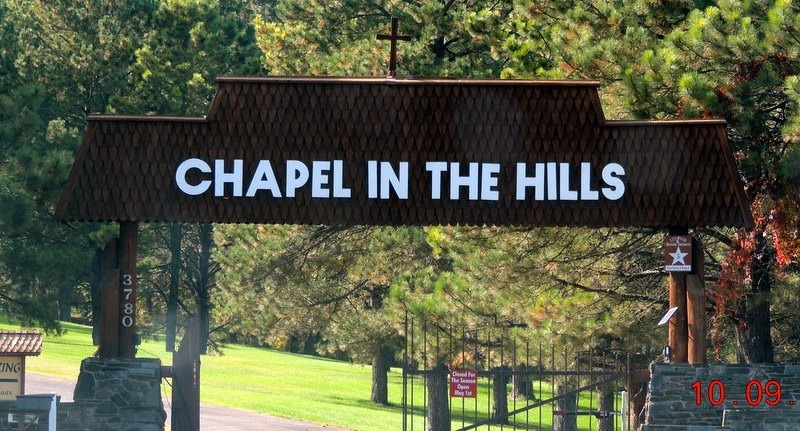 We left and went to visit the Chapel on the Hill. We arrived to find it closed for the season. 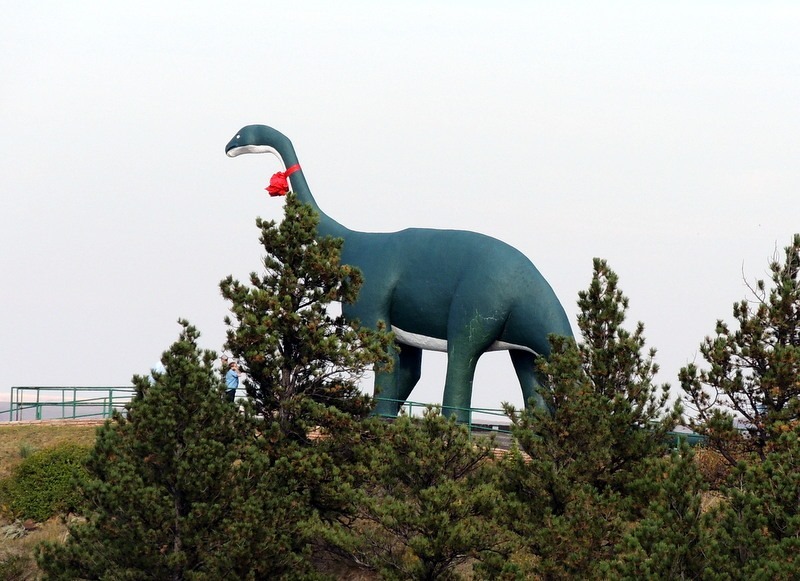 So we turned around and went to check out the Dinosaur on the top of the mountain. 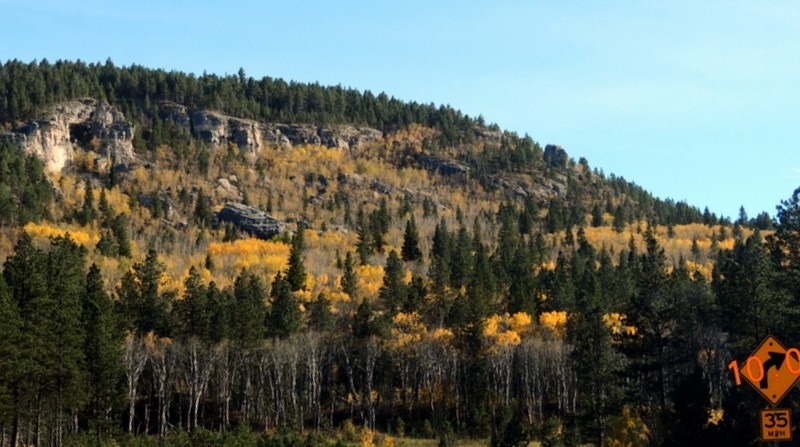 We left Rapid City and returned to the MH to walk the dogs. We arrived home at 2:30. So we decided to go to Sturgis. 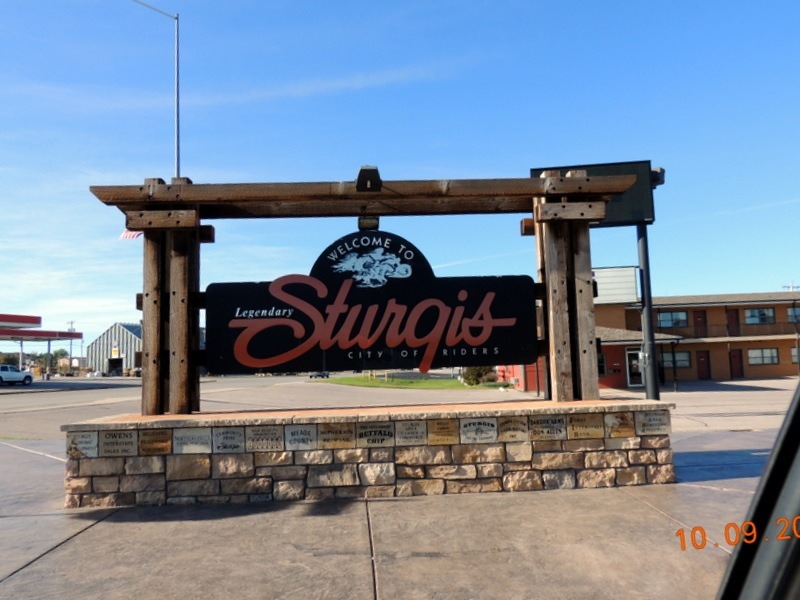 If you are not a motorcyclist, you may not be aware of Sturgis. Each summer there is a huge motorcycle rally that occurs in the town. The town is really motorcycle oriented with biker bars and motorcycle stores. Everything was motorcycle. 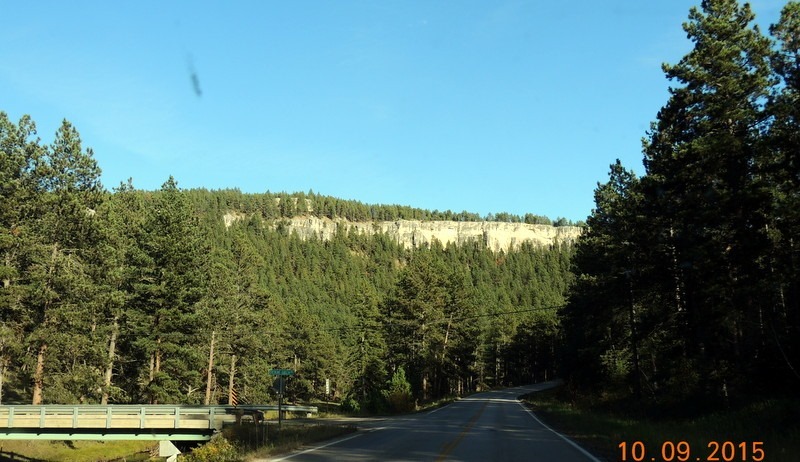 From Sturgis we drove the Vanocker Canyon Road. This was a pretty drive through a canyon. We are trying to take all of the scenic by-ways in the area. We had taken the dogs with us and they conveniently slept the whole way. We returned to the MH, ate leftovers for dinner, watched some shows on the DVR and went to bed.